A pedestrian refuge should be built for people crossing Forest Park Ave at Euclid Ave. The intersection of Forest Park and Euclid is one of the busiest pedestrian crossings of any major intersection in St. Louis outside of downtown. With the high density of residential and commercial to the north and the hospital and MetroLink station to the south, there is a constant stream of pedestrians crossing Forest Park Ave. But at seven lanes wide, Forest Park Ave is not the easiest street to cross. Fortunately, a few locations offer respite for pedestrians crossing the street: overpasses for Kingshighway and Grand Ave offer very wide medians while pedestrian refuge islands are available at Taylor and Euclid… except on the west side of Euclid. Pedestrian refuge on east side of the intersection. For several years, now, portions of the sidewalk on the west side of Euclid north of Forest Park Ave have been closed for new construction projects: first it was the Park East Tower, then it was the Nine North condominium and garage project, now it is a new building for BJC. These construction projects have kept the number of pedestrians crossing Forest Park on the west side of Euclid to a minimum. But with the sidewalk and the new BJC building poised to open in the coming weeks and months, the number of pedestrians crossing Forest Park without the added safety of a pedestrian refuge will soon increase dramatically. Given the volume of pedestrians crossing Forest Park at Euclid, it would be great to see the City of St. Louis or BJC mirror the east side of the intersection and add a pedestrian refuge on the west side of the intersection. A little added safety could go a long way. Do you mean the median? How does a median increase pedestrian safety? Do you mean for pedestrians crossing against the signal, ie jaywalkers? At a couple places I’ve seen these (and I’ll admit I don’t drive this intersection often), the median just seems to encourage people to play ‘frogger’ as they cross against the signal. I’m not sure that makes it safer for anyone. If you need an example of this gone bad, check out on SLU’s campus, West Pine at Grand. If there’s a better example of blatant crossing against the signal, and using the median as ‘shelter’ as cars whiz by, I don’t know what it is. I’m only vaguely familiar with the situation crossing Grand at SLU. I assume this image symbolizes the bad example you’re talking about. Personally, I’m surprised SLU hasn’t explored building a pedestrian underpass like WU has underneath Forsyth. North Hanley at I-70 also has a severe jaywalking problem, but as I previously wrote, it’s a street design issue. The refuges (or medians, if you prefer) along Forest Park Ave are slightly different in that they completely protect pedestrians. Forest Park Ave is also a much wider street than Grand. They increase safety because pedestrians are exposed to traffic for shorter periods of time. I cross that walk very frequently and it would be nice to have added pedestrian amenities available. It’s such a long walk across that it’s easy to get stuck in the center median. Also I really don’t think jaywalking is much of an issue here, because of the limited pedestrian visibility for seeing cars coming east on FPP. Also it would be nice just to have the median cleaned up. When it rains, water pools up around the median and I’ve been splashed a few times. 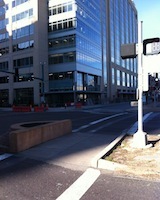 I hope that once the new clinic is finished BJH and WU will work on redesigning the crossing. I don’t necessarily think of pedestrian underpasses as ‘big city’. Nor do I believe one should be built underneath Forest Park Ave at Euclid. An underpass wouldn’t have clear lines of sight as both ends would likely require stairs and therefore it would likely be very underutilized.